Spent the day drinking way too much coffee, working on the first round of grammar/spelling edits of my novel. 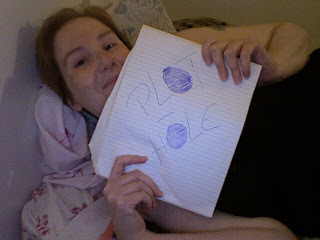 Made it to page 4 when I found a plot-hole. Well, actually, I was reading it out loud as I was at mother's watching Bold and the Beautiful and she looked at me all confused and pointed out the plot-hole. CRAP!!!! So I sat there thinking about the damned thing for about an hour, then went to the grocery and thought about it some more, bought the ingredients for a cheesecake went back to mom's made the cake and figured out how to fill in the plot-hole. Had many more cups of coffee, made it then to page 15 of the grammar edits, then watched the replay of WWE's NXT. And now, I'm typing this up before bed, as I have to go very early in the morning to take mom to another appointment. This is how into my plot-hole I was; while I was at the grocery thinking about my novel wandering in circles trying to figure out what to grab for dinner, Lemon-Zest Stock Boy was talking away at me and I didn't even realize it. I was that in my own little world. Then when I realized, it was too late to chat, one of his co-workers slid up to him flirting like there was no tomorrow. Isn't that a total kicker? But I feel great about things for the first time in months! Damn! I'm cute when I'm happy! Even without make-up.